Audio/Video is fine for all segments. I bolded what segments I believe should not have been accepted by any person who does segmented runs. Segmented runs are suppose to be using fastest movement, best strats, and pretty ballsy execution/routing. Segment 4: Very impressive segment. Didn't see any mistake at all. Segment 5: Pretty meh segment. Had 1 movement error and sorta meh luck in cannon game. Segment 12: Very impressive sgt. byrd section. Segment 17: Damn good segment. Mole section was literally flawless. Segment 18: Another good segment. Segment 24: That hit detection was pretty weird. Segment 25: Supercharger is awesome. Segment 49: Movement error was early on that this should have been a reset. Segment 53: I really see no need for invincibility to be gotten BEFORE the switched are head bashed. Segment 66: I fail to see the need to get the invincibility here too. Segment 67: Messed up jump near end is not good at all. As you can see 25 of them have what I believe to be unacceptable gameplay quality. 25/71 is a staggering number to me. In addition to these 25 segments many more have sub optimal movement (aka double jumping when not needed and not charging for as long as possible/as early as possible). Safe strats and uneeded deaths made this painfully obvious. Worst part was when I seen segment 61 where butterfly jar was just to ensure survival which in turn made collecting certain gems unecessary if taken out (1875 gems was just too much to ignore). I hope that the runner does this run again but if it's the same category realize that segmented means near perfection EVERYWHERE. It was still a very enjoyable watch for the most part but I must uphold SDA standards when verifying. The video and audio are fine, except for a slight blur I noticed in a few segments, usually coinciding with the swimming glitch (the only segment where it doesn't is segment 36, when he meets the mermaid). Any synch problems are due to glitches as opposed to encoding issues. Initial gem collection in Dragon Village is good. He manages to do the ledge jump on the first attempt. He collides with a tree, which is quite noticeable in the first segment. It takes him three attempts to activate the swimming glitch very early in a segment, and there are some minor mistakes before that. He uses the swimming glitch to skip large sections of Crocovile Swamp, and there's a good use of save-warping. Both Blink missions are very well done, and the few minor hiccups later that segment are more than made up for by those. The shooting missions could have gone better, and he misses a ledge, costing a couple of seconds. Excellent Ball Gadget course on the way to Dragonfly Falls. He takes a couple of attempts to activate the swimming glitch and hits a wall, but it's impossible to see coming. Otherwise, fine in terms of gameplay. The mop-up of Dragon Village goes well. Both Sgt. Byrd missions are excellent; there's a brilliant vertical U-turn in the second one. He misses the exit on his way out of the lab, and that's quite early in a segment. The boss fight in Gnasty's Cave is fine. The trick to get into Watery Tomb goes well, and the boss can't be beaten much quicker than this. He activates the swimming glitch without much difficulty, and uses it to grab an egg in Coastal Remains, before swimming past a couple of understandably startled crabs. No significant issues. Nothing too problematic in Frostbite Village apart from missing that ledge. The shooting missions are quite well done, and the Blink missions are excellent. He gets hit by a turnstile, but it's quicker than waiting for it to slow down. Gloomy Glacier is a mixed bag; the fight with the skeletons doesn't go well, and there's another whack from a turnstile in the same segment, but other than that, it's quite impressive. Ice Citadel has some good gameplay, but there's also a strange encounter with a Gnorc, which he dodges then gets hit by. Very impressive Sgt. Byrd missions. The return to Frostbite Village doesn't go quite as well as it could, but it's decent. Red's Chamber, however, is a low point of the run. The first round of the boss fight is good, but after that, it all goes downhill. He takes five hits, and intentionally throws himself off the arena to regain health. The pole jumping is good, though. Coastal Remains is good, apart from getting whacked by a spider as Blink. Sunken Ruins is another low point, if you'll pardon the pun. He gets hit at the first opportunity, not long into a segment, and his aim is a bit off in the vortex room. 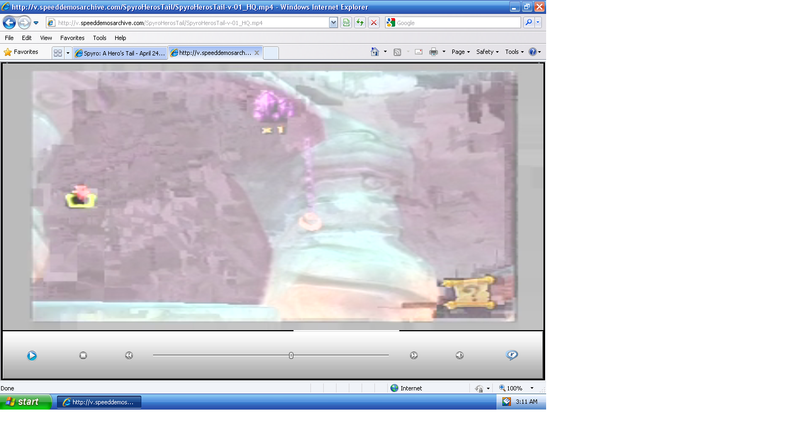 It looks as if he was a little bit jittery after losing Sparx, and the subsequent platforming section doesn't go well. His intentional death to get Sparx back at the start of a segment is vindicated by a later hit, but that shouldn't happen in a segmented run. The next visit to Coastal Remains has a few mistakes, but it's decent overall. The turtle game goes well. On to Cloudy Domain, the initial swimming is good. The Sgt. Byrd section is a game of two halves; the first mission is good, the second a bit rough. Excellent runs on the Ball Gadget course, and no real issues after that. Good swimming and passable shooting missions on Stormy Beach. A few mistakes and some rather conservative use of invincibility on Molten Mount, but good Sgt. Byrd missions. The top section of Magma Falls is decent, and the Ball Gadget course is good, but there are some mistakes in the lower section after that. Dark Mine is where it starts to look like something of a rush job. Lots of hits, and lots of small accuracy and movement mistakes that add up. I'm willing to cut a player some slack on the Blink missions due to their length, but these are easily the weakest in the run. I don't know what he's doing buying the Butterfly Jar; there's no real reason for it on a segmented run, and buying it means he has to spend time getting more gems later on. Red's Laboratory is better, but still has some mistakes. The return trip through Stormy Beach is fine. He gets invincibility where it's not needed again in Frostbite Village. Otherwise, no real problems. Good trip through Stormy Beach. The second visit to Red's Laboratory is another mixed bag. Some parts are good, but others should have been redone, in particular the segment that involves him bashing into a switch. The boss fight in Red's Lair is good enough. It's not a vastly bad run, and I think it's quite an entertaining watch. There's certainly a lot that can be learnt from it by anyone looking at attempting a run. However, it does have problems. Some of those segments really should have been replayed, and some of the things that are done – unnecessarily using invincibility, certain intentional deaths, buying the Butterfly Jar – are a bit too conservative for a segmented run. With these things considered, I'm going to say reject. - This portion of the run was very... how do you put it, okay I guess. I did quite enjoy the mini game routes although they are not that optimal. The speedway segments were very fun to watch, not really much of a problem there. The 1st and 2nd blink minigames are a problem though. On one of the blink games, the runner did not get a fast cycle on the flying platform, and the route for both minigames looked kinda meh. Another main problem was the movement, it could have been much better. At some points the runner charged into walls and had very sloppy movement. This should not happen in a segmented. That's all I have to say there. -This part of the run was very good. The only problem I saw here was that the runner didn't know that ineptune was rng based. You could have saved a good 45 seconds with perfect luck. If you notice sometimes when ineptune cancels her attacks, that's the rng. You can make her do that for every attack. I enjoyed the swim in air from ineptune to the night time dragon egg. I didn't expect the runner to get the egg like that. Other then rng, this segment was pretty good. - On the first segment of this hub world, it looked like the runner didn't know where the last electric thingy was, which wasted time. I did like the use of the shop though. There are many mistakes to point out. The red battle didn't go perfectly, the runner wasted a good 30-45 seconds by having to take an extra cycle, and on top of that, he used safe strats to death abuse on the last phase. Movement was another big issue with this portion of the run. Lots of jumps and plain movement could have been improved. Also in the blink section, the runner used safe strats during the climbing section, which wastes around 30 seconds. I did like the routing though. It was very cool. - This was probably the best part of the run. Obviously there was a few tiny mistakes such as movement and a death abuse. The main problem that I have with this entire run was the gem farming. Why did the runner decide to farm gems in the blink minigame, and this entire hub world? especially during the early parts of the run when he could have got a lot of gems in the ice citadel without wasting no more then 15 seconds, it makes absolutely no sense, and this is a major problem with this run. Other then that, the last hub was pretty good. - There's really nothing to complain about in this segment. The only problem I would have to bring up is in segment 70, the last dragon egg in this segment can be collected faster, by doing a very precise jump in between the lasers. Everything else was pretty solid. -I really enjoyed this run, but due to the bad gem management, and some flawed movement, I am going to have to say REJECT. I really hope the runner decides to redo this run, it was a very fun run to watch, and this site needs a good aht run. Thanks to the runner, and I hope he understands the mistakes that were made, and I hope he will fix them, and bring us a improved run, cheers . After watching this run and seeing most of the comments made by the other verifiers i cant say much else but sadly this is a reject. As mentioned earlier A/V is fine and there's no cheating. Overall the gameplay is...sloppy. This run is quite the dilemma because it's not terrible, but at the same time it's not exactly up to standards. The routing is solid but as verifier 1 said it goes out of the way for extra gems a lot. Anyway since I’m linking to videos on my YouTube channel I’ll come right out and say that this is I have no name. Segment 1: Unnecessary double jump before the egg. Tree bonk near the end. Pretty sloppy start but I can relate to taking a slightly sloppy segment that has a lot of cutscenes. Segment 2: 2 failed attempts at getting OOB. It's 15 seconds in, resetting to missing it isn't an issue, I reset over RNG in SS runs farther in than this (and yes, resets take about the same amount of time as in this game). Last egg could be gotten sooner. Segment 3: Enemies drop 25 gems-same as a chest. He passed up a basket back in segment 1 that takes less time than the first plant. Going for the light gem in the temple of doom could have been done faster via charging more. Segment 4: Skips another basket for a plant. Blink minigames are 1:43 and 2:23. He goes out of his way to kill a few spiders for gems, not sure if these are necessary. The first Blink minigame is unacceptably slow, I my best is a 1:31, most of which was re-familiarizing myself with the controls. The 2:23 is solid, though I have a 2:19 by a faster last room strategy. One less pole spin could be used going for the 2nd fireworks chest. Segment 5: The first turret is very good, but the second is a 53. My best time on it is a 46 so that’s a lot of room for improvement right there. The movement heading for the locked chest is bad, complete with a missed jump. The final dragon egg is also gotten very slowly relative to segmented strats-there's no need to play it safe and not charge on the platforms. Segment 6: Missed box on the ball gadget could have replaced an enemy. Say, the enemy killed after the ball gadget section. Not as big of a deal as skipped the 100 gem that could have replaced 4 enemies in the route. Segment 7: Horrible gem route, kills enemies instead of getting baskets/dark shards. The goats at 1:25ish are worth it since there's a few of them and they'd hurt otherwise. Segment 8: Sparx sections are autoscrolling. There is a "charge" button and the runner doesn't waste any of the charge gauge. There is a lot of gem collection here, which is good as there's nothing else to do. The swimming is done very well too. This is the first segment I don't have any complaints with. Segment 9: I'll echo the comments, this was short. Segment 10: It needed to be short though, due to the shortcut to cut out a return trip later after learning how to wall jump. Another good segment here, not much to it though. Segment 12: Missed a chest en route to the final dark gem of the hub. His Byrd times are 0:57 and 1:23, and my bests are 0:56 and [1:18. The 57 is good but the missiling in the 2nd challenge could be better. Segment 13: I find it funny that the secret exit is used in this run. Getting caught behind the door should have been a reset on the segment, and the death is a waste of time as no damage is abused in the 3rd phase of the fight. Overall first hub route: Nothing really jumped out at me as a "THIS NEEDS RE-ORDERING" until I saw the Flame cutscene get triggered. I'm pretty sure you can get around the trigger with swim in air while still getting the egg, and the ideal place for it would be after getting the 25th light gem above the Professor's Lab to avoid dropping into the entrance. Segment 14: Simple OOB clip, nothing to see here. Segment 15: Slow death at the 3rd phase of the fight. Why is Ineptune so boring. At least her death speech is silly After the boss fight the runner clips out of bounds and gets a light gem that’s less out of the way now than later before heading to the Ice World and deactivating the “security system”. A couple seconds are wasted approaching the final electric switch. Perhaps a cycle on the moving platform could have been saved by executing that better? The bonk on the way to the Light Gem looks bad, but it hardly wastes any time and on its own wouldn’t be reason enough to reject the segment. Segment 16: Solid tedious turret section. The enemy should have been avoided and the jump made, there’s no excuse for those mistakes. Segment 17: The runner gets 2:41 and 3:20 on the Blink stage, my bests are a poorly executed 2:25 and 2:57 (3:03 recorded). Neither run uses the consistent movement pattern to complete the hanging section without killing the pillbugs. The hit taken in the hub looks bad since I know you can slip through there unscathed, but this would be a nonissue compared to the massive timesaves you could get from pacifist hanging. The thief is handled very well, especially given how trolly it can be. Segment 18: Loses a bit of time getting caught on a tree early. Then my favorite cutscene in the game happens, with the Hunter metaknowledge and fourth wall breaking and Sparx’s silly freakout. The 4th yeti should have been killed with a dive kick. Segment 19: The hit in the ambush room looks bad, but waiting for the fodder later is what makes it bad. The double hit to the spiky thing should have restarted the segment. The final dragon egg can be picked up faster as well. Segment 20: I liked the bat dodge, but was the savewarp really faster? Segment 22: I actually didn’t know you could kill the beetle things with explosive arrows. The second half of the climb should have been over the top due to the halting beetle. Segment 24: The charge-away wall always trips me up when I’m replaying this game. Killing the enemy there was totally unnecessary, and a waste of time especially after being hit. Lightning breath knocks enemies out of their attack animation and into a stunned animation regardless of what else is going on-so waiting for the enemy is unnecessary. Segment 25: Another 124 gems passed up that could easily have been picked up in place of a few enemies from much earlier in the run. I’m now convinced that the runner used a greedy algorithm in planning gems and not a time/quantity comparison. Segment 26: Good Spyro movement, the runner gets 0:58 with a large waiting period at the end and 1:02 on the Byrd missions. My bests are 0:53 with less waiting and 0:59. For the routes used, this is very well executed, but the routes aren’t optimal. Segment 27: As a final nail in the coffin for the gem route, over 4000 gems are skipped in this segment. This would make a butterfly jar affordable-not that it should be gotten in a segmented run. It would also alleviate any enemy kills earlier in the run, as in segment 30 the runner has 92 after buying the keychain. Segment 28: It’s a thing. Segment 29: It’s also a thing. Nothing to say on them. Segment 30: Keychain get. Flawless Red first phase. Sloppy hit in the second phase, nothing too bad on its own but the fact that there was a second hit pretty much kill the segment in my eyes…and then the runner death abuses. Why would you ever do that in a segmented run FOR SAFETY. The lasers can be hard to see coming but really being hit to them twice looks awful. Doesn’t cost time though, but it would have been a death if there wasn’t a death abuse, which would have been a reset, which would make it a better run in the end. Segment 31: I don’t care how finicky those poles can be you can freeze them in the same jump you use to get onto them. Dude, this dude gets the light gems from the dude’s pond, dude. Duuude, it’s not even slow. Dude. 2nd wheel could have been mounted better though dude, awww dude, the runner dude is bleeding time everywhere dude. I’ll stop mocking the surfer dude now. You can electrocute the platform as you jump onto it when getting the final dragon egg here. Segment 32: Dude, more stuff with the dude, dude. DUDE! Duuuuuuude, this dude of a segment was pretty much flawless by the dude, dude, due to the shortness. Them savewarps dude. At this point I pretty much lost interest in giving detailed comments in each segment, and the other verifiers covered it pretty well. I do hope the runner gives this another attempt with the faster minigame strats, I would be happy to assist in routing the remaining Sgt. Byrd and Blink games. Overall this is a reject from me, on the basis of poor routing and many execution errors in a segmented run. Just popped in to address the critisisms here, I'll start with the common ones. I'll start by saying that I didn't know just HOW strict the guidlines were for segmented runs, a lot of my mistakes didn't seem that bad, but I suppose they do add up. I'll also say that a lot of it was because, well hindsight, i'd keep a segment, then too late realise it was mediocre, whether or not this run would always be determined by how strict the verification guidelines. Red Fight: I'll admit this was a case of hindsight being 20/20, I didn't realise just how bad it was, when I thought about it after submiting the run I knew that this segment could get me a reject by itself, entirely my bad here. And now for the in depth ones. Didn't expect to get hammered over Segment 2, but if you look at it from my perspective, it makes sense why I would give myself a little leway on the glitch. For starters, the game would Autosave every time I started this segment, adding a second on to the game clock even if I quit afterwards. This means I had to go through what was effectively an unskippable cutscene every time I restarted the segment. -Turn system off, then back on. -Wipe save in slot A, copy save from slot B. Segment 5: Cannon game has HORRIBLE RNG, the next best I ever got was one perfect game with one GOD-AWFUL one. Segment 13: Like I said, controls glitched, though I will admit that my hindsight would have been more useful THEN. Segment 61: bought the jar because I knew I was going to get hit a least once. Verifier 2: Blur is directly caused by swim glitch, the game puts up a "filter" for your vision underwater, due to the way I would glitch the game, I never get out of the water "properly", so the game would never remove the filter. Verifier 3: I fairly certain that Ineptune only cancels attacks to "puke", need video proof. Extra cycle would have happened no matter what, the game finish loading areas and starts platform cycles when you get "close", exactly how close varies by the area, but I would have been stuck waiting no matter what I did. Did not know you could jump between the lasers. I have no name: Did not find minigame strats despite searching on Youtube, can't use what I don't know. Segment 13:Fairly certain that going out of my way for swim elimnates all saved time from cutscene skips, will check before I do another run though. Segment 20: Save-warp is just faster, game time ends as soon as I pause, death-warp is a split second slower. Segment 24: Killing said enemy is required, the door to the next room won't open if you leave him. Just going to say that the autosave in this game just makes it a huge pain to speedrun this game, with only two memory cards I can only restart whatever segment I'm on, which prevents my hindsight from being useful. I recommend that any future runners use capture cards instead of dvds, mainly so that they can clear their head and actually watch the segment before deciding to keep it or not, I would have used one myself if my computer weren't so sucky. At the very least, there's a good starting point for future runners to look at now, whereas before there was almost nothing on speedrunning this game. I'm not sure whether or not I'll try to run this again, if I do I'll probably switch to SS, not out of lazyness, but because of what I said in the last paragraph. Just popped in to address the critisisms here, I'll start with the common ones. I'll start by saying that I didn't know just HOW strict the guidlines were for segmented runs, a lot of my mistakes didn't seem that bad, but I suppose they do add up. I'll also say that a lot of it was because, well hindsight, i'd keep a segment, then too late realise it was mediocre, whether or not this run would always be determined by how strict the verification guidelines. [b]Red Fight[/b]: I'll admit this was a case of hindsight being 20/20, I didn't realise just how bad it was, when I thought about it after submiting the run I knew that this segment could get me a reject by itself, entirely my bad here. Gem Route: Totally derped when I skipped those chests in the Ice Citadel, I somehow got turned around and decided to go with it. I didn't think it would come back to bite me. I will admit the gems were semi-improvised, but I thought that common sense would allow me to come out with a good gem route, guess not though. >.< And now for the in depth ones. Verifier 1: Didn't expect to get hammered over Segment 2, but if you look at it from my perspective, it makes sense why I would give myself a little leway on the glitch. For starters, the game would Autosave every time I started this segment, adding a second on to the game clock even if I quit afterwards. This means I had to go through what was effectively an unskippable cutscene every time I restarted the segment. -Turn system off, then back on. -Wipe save in slot A, copy save from slot B. -UNSKIPPABLE LOGOS. -Play up to glitch. Segment 5: Cannon game has HORRIBLE RNG, the next best I ever got was one perfect game with one GOD-AWFUL one. Segment 13: Like I said, controls glitched, though I will admit that my hindsight would have been more useful THEN. Segment 16: I don't know WHY I ever kept this segment, I knew it was a mistake about five seconds after it was too late. >.< Segment 61: bought the jar because I knew I was going to get hit a least once. Verifier 2: Blur is directly caused by swim glitch, the game puts up a "filter" for your vision underwater, due to the way I would glitch the game, I never get out of the water "properly", so the game would never remove the filter. Verifier 3: I fairly certain that Ineptune only cancels attacks to "puke", need video proof. Extra cycle would have happened no matter what, the game finish loading areas and starts platform cycles when you get "close", exactly how close varies by the area, but I would have been stuck waiting no matter what I did. Did not know you could jump [b]between[/b] the lasers. I have no name: Did not find minigame strats despite searching on Youtube, can't use what I don't know. Segment 13:Fairly certain that going out of my way for swim elimnates all saved time from cutscene skips, will check before I do another run though. Segment 20: Save-warp is [b]just[/b] faster, game time ends as soon as I pause, death-warp is a split second slower. Segment 24: Killing said enemy is required, the door to the next room won't open if you leave him. Yeah save-warps dude! Duuude. Just going to say that the autosave in this game just makes it a huge pain to speedrun this game, with only two memory cards I can only restart whatever segment I'm on, which prevents my hindsight from being useful. I recommend that any future runners use capture cards instead of dvds, mainly so that they can clear their head and actually watch the segment before deciding to keep it or not, I would have used one myself if my computer weren't so sucky. At the very least, there's a good starting point for future runners to look at now, whereas before there was almost nothing on speedrunning this game. I'm not sure whether or not I'll try to run this again, if I do I'll probably switch to SS, not out of lazyness, but because of what I said in the last paragraph. I'm also somewhat interested in picking this up for a 100% SS run, got a few other runs I want to get to a point where I'm happy with so I don't overextend though. Well everything in the Blink games I found in less than 5 minutes of looking at the level (including the pacifist strat for Snowed Under). The Sgt. Byrd stuff took a bit more looking-your 1:02 on Iceberg Aerobatics II took me an hour to beat, but I did improve the route in the end :P I'm also somewhat interested in picking this up for a 100% SS run, got a few other runs I want to get to a point where I'm happy with so I don't overextend though. I know this is likely a problem on my end, but why do the vids look like this? EDIT:This too, note that the vid is playing in this pic. why do the vids look like this? 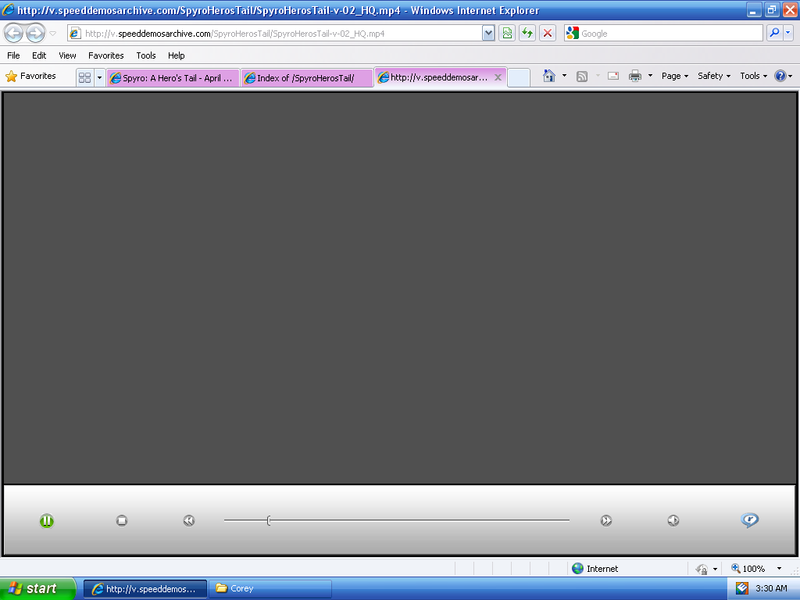 Probably because you're trying to watch them in Internet Explorer rather than an actual media player. [quote="DarkBowserXI"]why do the vids look like this? [/quote] Probably because you're trying to watch them in Internet Explorer rather than an actual media player. I can't seem to get the vids to directly play in a media player, can someone tell me what I'm doing wrong? Is it intentional for the final verifier's name to still be visible after 'Quote'? Right click, save target as, open folder, double click ;) Is it intentional for the final verifier's name to still be visible after 'Quote'? Try reading two lines down. Yes. I linked to my YouTube in my verification so there was no mystery about it anyways. [quote="Alko"]Is it intentional for the final verifier's name to still be visible after 'Quote'? [/quote] Yes. I linked to my YouTube in my verification so there was no mystery about it anyways. @Alko. Just tried it, still having the same problem, any ideas? @UA: Ah, sorry, didn't actually read that comment, was just surprised and assumed a human error. @Alko: Got it to work on VLC, thanks for the tip. I'll probably have the vids up on my youtube sometime this week. @Alko: Got it to work on VLC, thanks for the tip. I'll probably have the vids up on my youtube sometime this week.